Our place is close to parks for hiking and biking, restaurants and dining, gold mining, the Historic Julian town and beer and wine tasting. Lake Cuyamaca is a short drive away where you can rent a paddle boat or test your fishing skills. You’ll love our cabin because for a mountain home, it has a refreshing amount of space for all to spread out and relax without feeling crowded. It has the perfect mix of vintage charm with modern amenities and the game room entertains kids and adults alike. PERFECT MOUNTAIN GETAWAY! This is the home you picture when you decide to spend time away in the country. 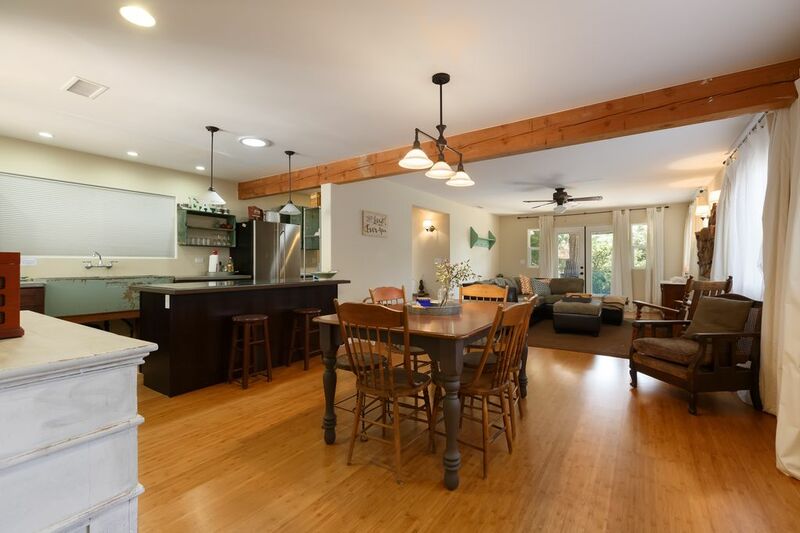 It is located in the beautiful wooded neighborhood of Pine Hills about 4 miles from the historic town of Julian at an elevation of approximately 4,000 feet. Various fruit trees decorate the property adding to the characteristics of the retreat. Once you enter, you find a delightful mix of the old west and country chic. There are two large bedrooms and two full bathrooms. The master bedroom has a king sized bed and a twin pull trundle day bed for up to four guests. The second bedroom has a queen sized bed for a comfortable space for two guests to share. In addition, there is a cozy nook off the second bedroom with bunk beds for your kids. It provides a separate space for sleeping, while keeping them close enough to hear if they want you. There is also a pull out queen couch in the family room. The open well lit living room draws you in to a comfortable and rich area with couches and chairs circling the propane fireplace. The dining room just calls out for the family to pull up a chair and sit together over a home cooked country meal. The open floor plan allows guests to dabble in the kitchen while visiting with others in the living room and dining area. There are even counter stools, ready for you to pull up and sit for a while. The kitchen is a delightful step back in time, while boasting all new appliances. The sink is an amazing old washtub and the cabinets mix a touch of old and new. The appliances are top of the line stainless steel which include a large refrigerator, a dishwasher and an oven/stove. If you want a little time off to yourself, you can tear yourself away to the lovely sitting room with more chairs and a couch where you can curl up with your favorite book, work on puzzles, or watch a movie on the television (note: there is no cable tv). Although this already is enough for any fabulous getaway, throw in the huge game room in the back of the home. There is a full sized ping pong table, plenty of sitting room and comfortable furniture for bringing the entire group together for real family time. Everyone can sit and watch the ping pong game, visit with each other, curl up in a chair or on a couch, and just enjoy. The home also has a large pass through window directly from the kitchen, so while everyone visits, snacks, treats and tasty delights can be passed through to all the guests. And once the sun sets, there is nothing like the Julian sky at night. Without the distracting glow of the lights in the city, the sky is blanketed with so many stars that feel as if they are close enough to reach out and touch. Deer wander around the property, as do wild turkeys and a host of other wildlife. As guests, you will simply melt into the surroundings and find all your stress and worry floats away. A calm and quiet found no where else surrounds you and you will never want to leave the mountain. The home is almost 2,000 square feet, plenty of room to spread out and enjoy yourselves! There is a large game room with a ping pong table, darts and games. For stays longer than one week, we will provide access to the laundry room. We love to travel and try to do it as often as possible! I grew up in the mountains in Northern CA (Matt is a SD native). While I love living in San Diego, the mountain girl in me misses the trees and open space. We bought this home in 2016 and are thrilled to share it with others. It truly is a magical place. The trees, the area for the kids to play in back, the generous amount of space even though it's a two bedroom. I also love that it's perfect for two families with family "suites". I loved all the rustic touches that were there from the previous owner, the authentic antiques, hand painted signs and wood details. But with all the rustic elements, it's a clean, contemporary home as hope you love it as much as we do! We will provide linens and towels for the number of guests indicated. Please note we do not consider the game room a sleeping area, thus no linens will be provided there. We have wi-fi but no cable tv...we recommend you turn off devices and enjoy the outdoors while you are here! Basic spices and some condiments will be at the home. The kitchen is well stocked with basic spices and some condiments. There are plenty of bowls, pots and pans and there is even a blender and crock-pot. The dining table has 6 chairs and there are two bar stools at the island. If you need other chairs, you may use the game room chairs (please just put them back when you leave). There are a few books, feel free to read one while there and if you love it, take it home with you! Ping pong table and many games and puzzles to choose from. Note: there is NO heating or a/c in the game room. Not a ton of toys, but a few for the little ones and some books as well. We have a good selection of movies to enjoy. Plenty of options for the kids! The house was very spacious and my group really liked the rustic look of the place. We had a great stay and we are definitely planning on coming back. So glad you enjoyed it....we hope to see you back again in the future! This home is very beautiful and roomy. It worked so well with my large family. There was a lot of room to spread out and many choices for everyone in terms of where to sleep. We enjoyed the ping pong and darts very much and loved the space. When a question arose, Joanna was right on top of getting back to me and helping us out. We'll definitely rent this home again! Thanks so much for staying, we hope you come back again. Have a great 2019! So glad you had a good time, we hope you come back soon! The house is incredibly spacious! Decorated very beautifully, you will find that you are staying at wonderful home. There are multiple rooms to gather in and a large kitchen area to prepare meals. One of the best weekends we had with friends. Cannot wait to return!! Clean, very large, super cute decor. We enjoyed our stay very much! Thanks so much for your lovely words! Please come back and stay again. This was an incredible get away in the mountains! The house is very spacious. Plenty of room for the entire family. I highly recommend this place! Thanks so much for your kind review. I am always delighted to see that people love our retreat so much! I certainly hope you come back soon! Our lovely mountain home is located about 4 miles from Julian. It's a great historic little town with lots of shopping and restaurants. We also recommend spending time in Wynola at the Wynola Junction, Julian Mining Co. & Fort Cross Adventures!